This FAQ will allow you to test your Facebook pixel working. If you don't know how to install the pixel on your shop, click here to visit our FAQ on this subject. Please follow all the steps in right order. Once you have checked that your pixel works propoerly, you will be able to use the registered data to create perfectly targeted audiences for your adds and set up dynamic remarketing (re-targeting of your visitors according to what they've seen on your site). For more information on pixel use, click here. 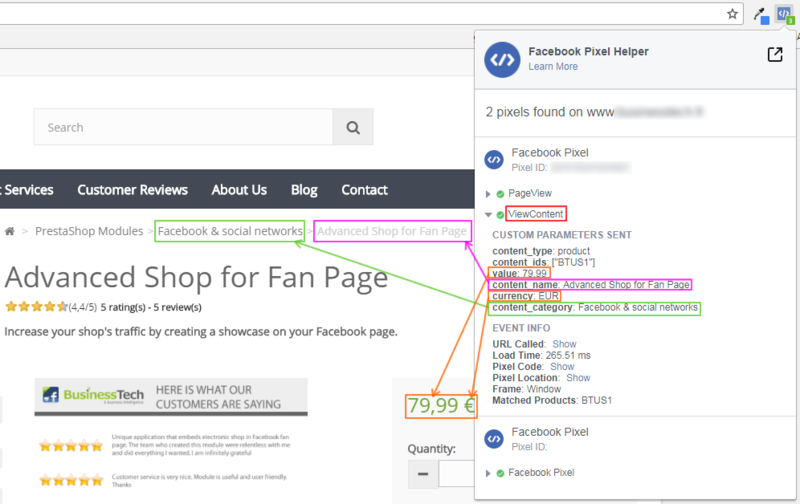 To reach the Facebook official documentation about Facebook pixel test, click here. To test your pixel working, you first have to install the "Facebook Pixel Helper" extension in your Google Chrome browser (if you don't have Google Chrome, you can click here to download it). To do that, re-open this FAQ into Chrome if you are not already using it, then click here. "Pixel Helper" is a tool that will allow you to display the data of the pixel installed on your shop and to check that it works properly. 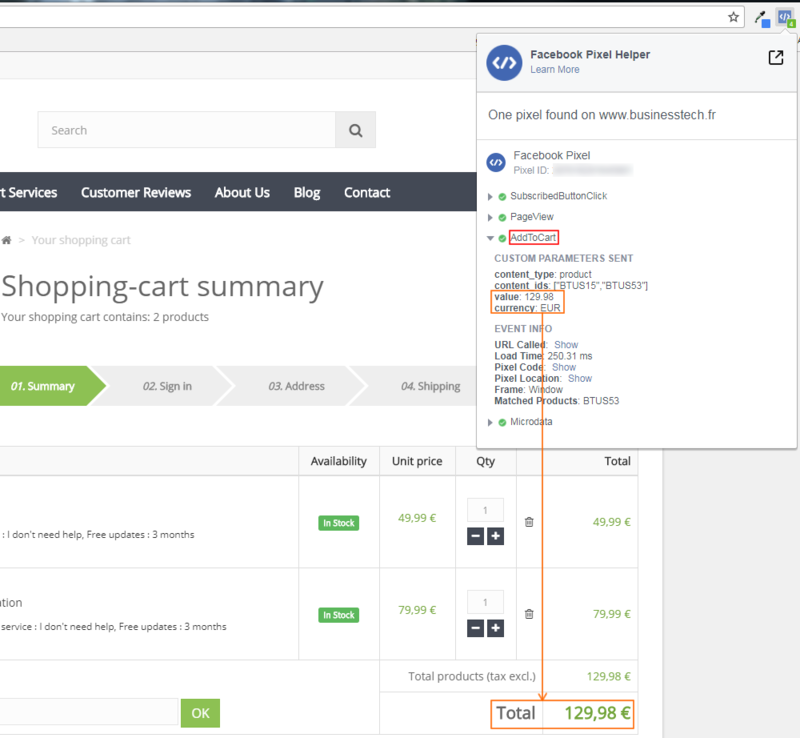 We are going to take the example of four different types of page: a product page, a category page, the cart summary page and the order confirmation page. 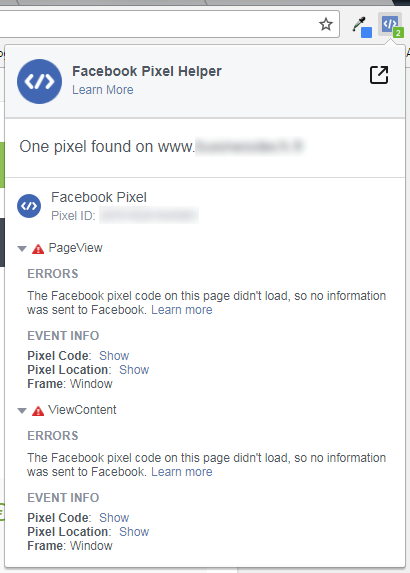 If the pixel works, you must have an icon showing a white ckeck mark on green circle next to all the events loaded by the pixel (see "PageView", "ViewContent" and "Facebook Pixel" in the image above). If you have a yellow (warning) or red (error) icon go to this FAQ third section to solve the issue. "PageView" means the event loaded is the view of a page. This event will always be displayed by default and this is this event that will allow you to create specific audience rules. On a product page of your shop, click on the Pixel Helper icon. You must see, among others, the "ViewContent" event. The term "ViewContent" informs you that this is the content of a product that has been detected (ie that this is a product page). Check that you get this information and that this is correct. On a category page of your shop, click on the Pixel Helper icon. You must see, among others, the "ViewCategory" event. The term "ViewCategory" informs you that a category page has been detected. Add some products in the cart and go to the cart summary page. Click on the Pixel Helper icon. You must see, among others, the "AddToCart" event. The term "AddToCart" informs you that you are on the cart summary page. 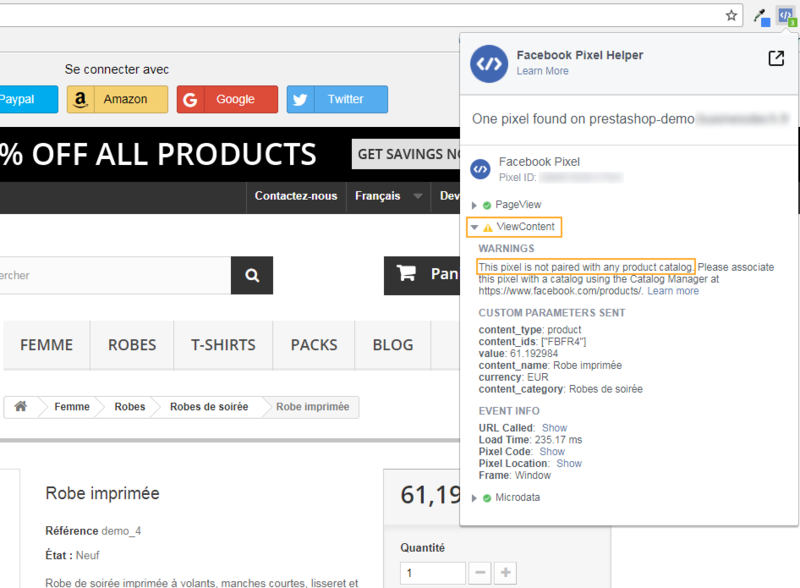 Place a test order and once you are in the order confrmation page, click on the pixel helper icon. You must see, among others, the "Purchase" event. 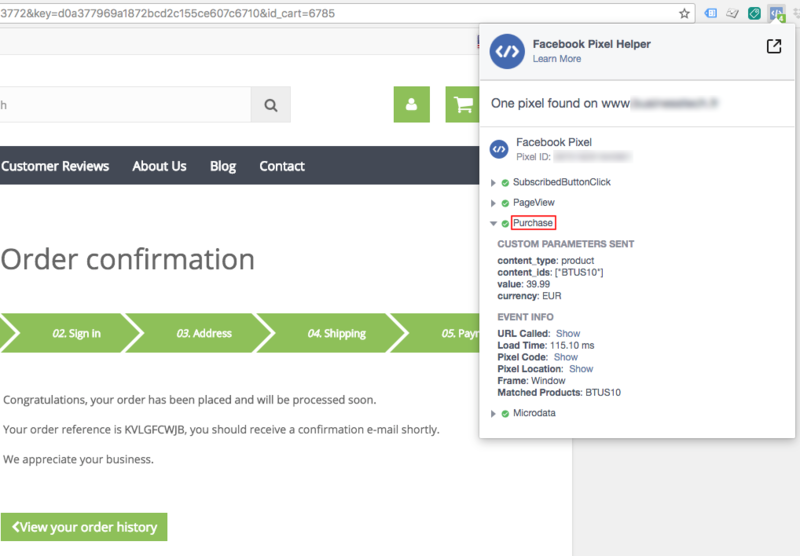 The term "Purchase" informs you that you are on the order confirmation page. I get warnings or errors in Pixel Helper: what should I do? Either that the product catalog has not been exported to Facebook yet. In this case, export it by following this FAQ: How to import my products on Facebook? Or that you have created exclusion rules and the product/category on which you are displaying the Pixel Helper takes part of these excluded products/categories. In this case, return to the module configuration and check your exclusion rules. In any case, this warning will generate an error in the pixel diagnostic of your Business Manager account. Indeed, Facebook can't track products that it is not aware of, since they have not been exported. 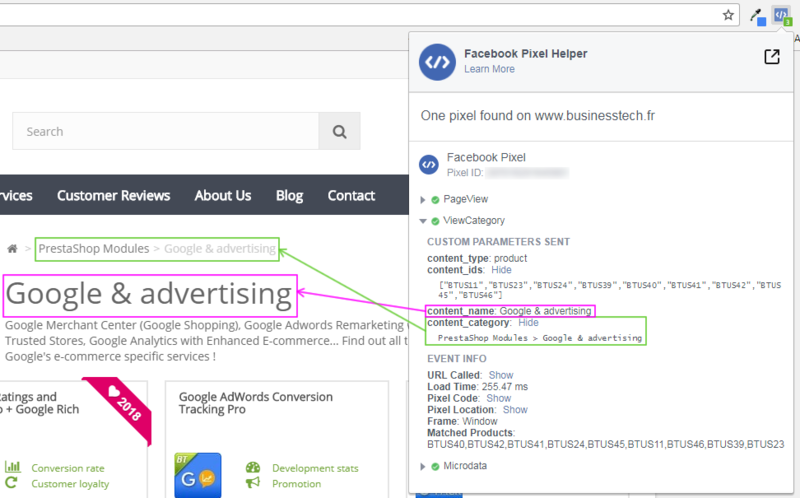 You will not be able to track the events related to these products, nor to set up dynamic remarketing. Correct the error and redo the test. Once the products are exported, you should not have this type of warning in the Pixel Helper. It means that the pixel generates errors. This can come from the installation of an ad blocker like "AdBlock" on your browser. The pixel can't work with an ad blocker since it precisely allows to advertise. So please note that this doesn't come from our module. Disable "AdBlock", refresh the page and click on the Pixel Helper icon again. If all is green it's that the error actually came from the ad blocker. Important note: your Pixel Helper may be green whereas the pixel diagnostic in the Business Manager indicates errors. 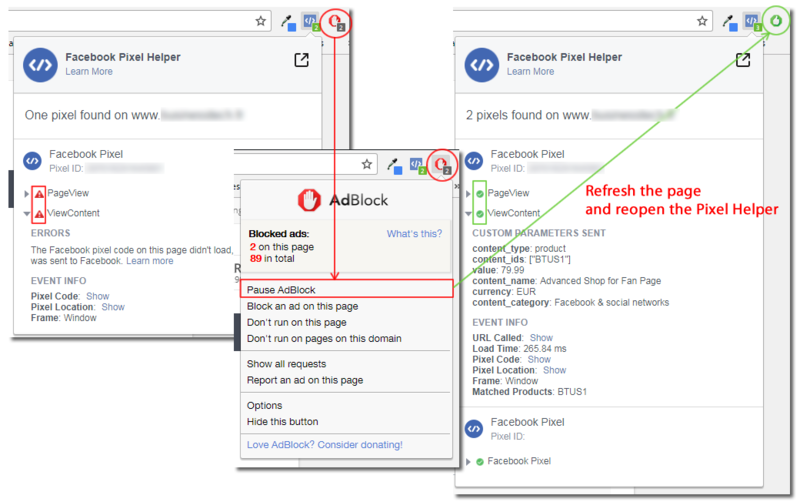 In fact, it's enough that only one of your visitors has AdBlock (or other advertising blocker) installed on his browser when consulting your site, for Facebook to indicate an error. This doesn't mean that the pixel doesn't work. This simply means that some of your visitors don't want to be tracked and have installed ad blockers. Their activity on your site will not be registered (or only partially). That's their right and you can't do anything about it ... From the moment the information given by the pixel helper is all at green on your browser it's that the pixel works properly and you must not take into account the errors or warnings generated in the pixel diagnostic. My Pixel Helper is green but the Business Manager shows me errors: what should I do? Your Pixel Helper may be green whereas the pixel diagnostic in the Business Manager indicates errors. From the moment the information given by the pixel helper is all at green on your browser it's that the pixel works properly and you must not take into account the errors or warnings generated in the pixel diagnostic. My pixel doesn't trigger: what should I do? it's probably due to a change made by your theme in the footer.tpl template in charge of the footer display. This string allows the call to the PrestaShop footer hook which allows, through a suite of call to functions, the triggering of the pixel. If you don't find this string or if it's placed in comments, then the call to the footer hook isn't done and the pixel can't be triggered. Then, you must ask your webmaster or theme editor to restore the call to the PrestaShop footer hook.